If I called my mom and asked her to name her top five quick dinners for the decade or so when she was chasing after three little girls not yet of leave-them-home-alone age, I’d place a sizable bet that her definitively American goulash makes the list. Maybe a few of you landed here looking for the traditional Hungarian dish, of which my knowledge is limited to the Google search I did five minutes ago. I’m sure you’re disappointed to see a big pile of elbow macaroni and, wait, is that…corn? Even so, I urge you to stay. The dish I’m about to explain is quintessential “retro” American dinner food, but, as I often do with my 8-year-old self’s favorite foods, I set out to revisit this one so I can make even more memories over it with the newest little Schatteman family: myself, my hubby, and, of course, our baby puglet Clarence. As tempting as it was to cover the classic American goulash of my childhood in cheese and bake it in the oven, I found a few alternate ways to help it mature, without adding prep time or calories. If you’re new here, let me bring you in the loop: I like my comfort food meatless and nearly gluten free at this point in my life. Mushrooms were an easy choice to replace the ground beef typical of American goulash: they brown up quickly and go well with one of my few ingredient additions, red wine. In a way, it’s a much quicker play on my favorite, slow cooked mushroom marinara sauce. 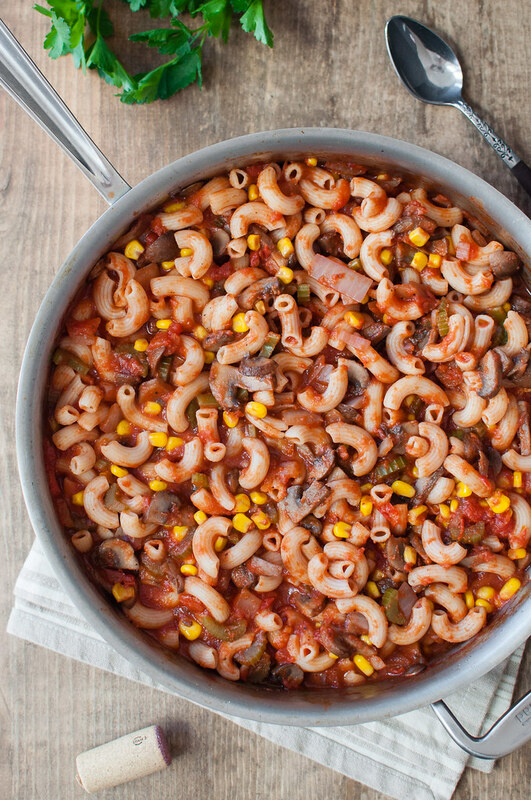 Whether by accident or design, my version of goulash is vegan. You’d never guess it by the taste and texture, but I also managed to switch out “real” pasta for gluten free elbows without overcooking the pasta or upsetting Steve. In fact, even he had to confirm what type of noodles I used. So just keep your lips zipped and no one will be the wiser (but they might be a little skinnier). True, I could have added real garlic or fresh tomatoes or any number of other flavorings, but I’m trying to build my own arsenal of quick and healthy family dinners, so I kept it simple this time with very easy-to-find pantry ingredients and no garlic to mince. If store-bought tomato juice frightens you, I tested this recipe a second time substituting leftover tomato soup (this one, also vegan) for the juice, and while definitely not necessary, it added a dimension to the final sauce that might even please the advanced foodies in search of Hungarian goulash. Vegan/gluten free option. 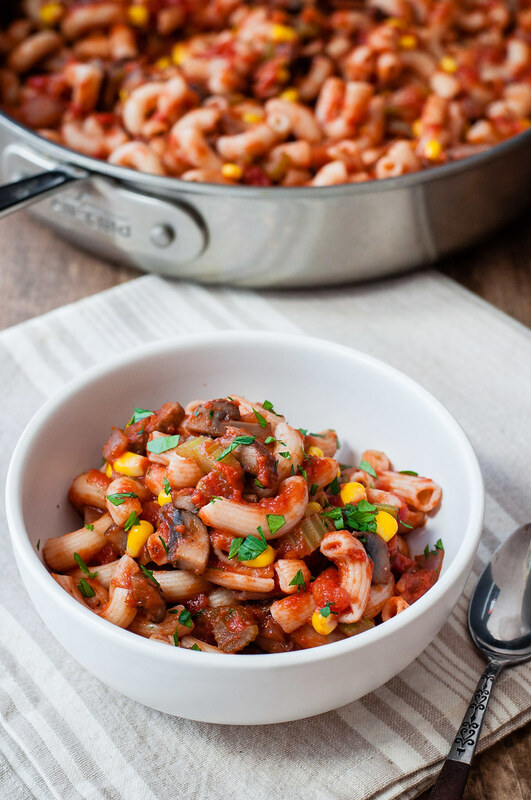 My mom's exact, well-loved goulash recipe, updated to replace the ground beef with equally meaty mushrooms. 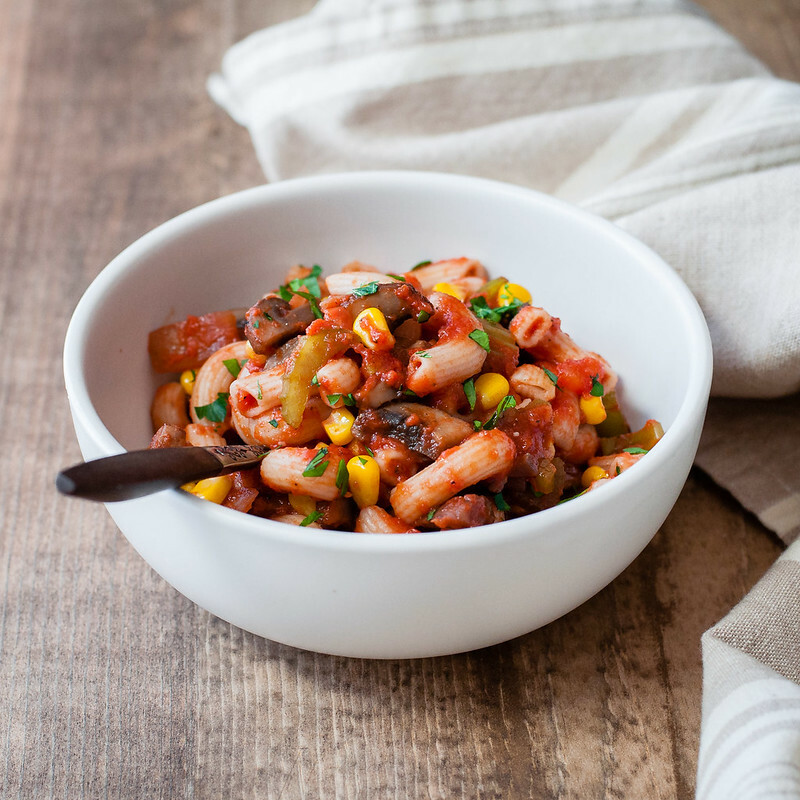 Make it either way for a crowd-pleasing, kid-friendly family dinner. Heat oil in a large skillet or pot (about 3 qts.) over medium high heat. 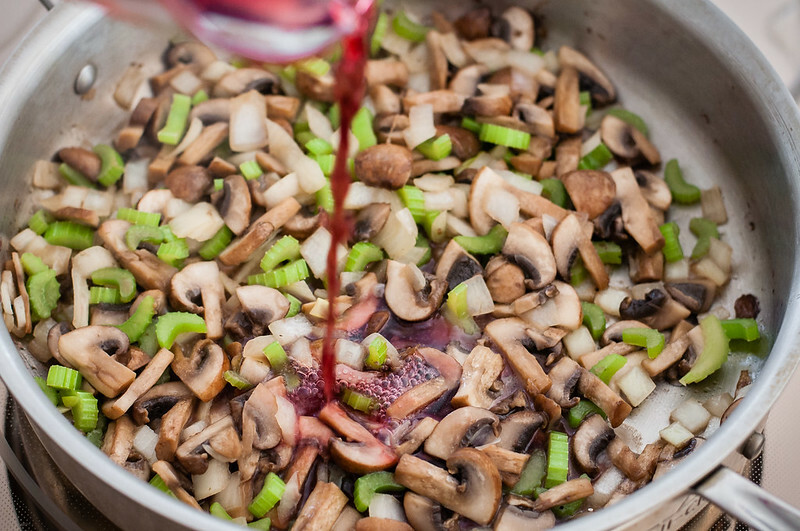 Add mushrooms, onion, and celery and sauté until mushrooms are tender, vegetables are softened, and any extra liquid from the mushrooms has evaporated, about 6 minutes. Add red wine, if using, and simmer until the pan is almost dry, 4 to 5 minutes. Add the corn and cook until thawed and warm. 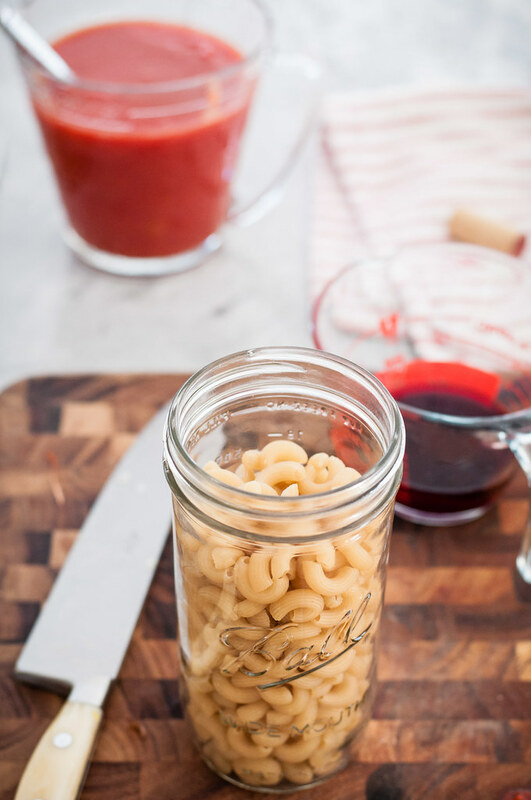 Pour in tomato sauce, tomato juice, and cooked pasta and stir to combine. Simmer a few minutes to thicken the sauce, but not so long that the pasta overcooks. Off heat, toss with a little parmesan cheese if desired (not pictured). Season with garlic salt and black pepper to taste, and serve in bowls. For the tomato sauce, almost any thick, slightly chunk sauce will do. I've tested the recipe using canned crushed tomatoes in puree as well as leftover thick tomato soup. I made this for dinner, although I did use regular noodles, my kids loved this recipe! Will definitely be adding this one to our recipe file! Thanks Lia! I can say with confidence that this one is kid friendly, since we loved it as kids, too! If I wanted to use fresh tomatoes, garlic and not add in the wine what should I change with the recipe? 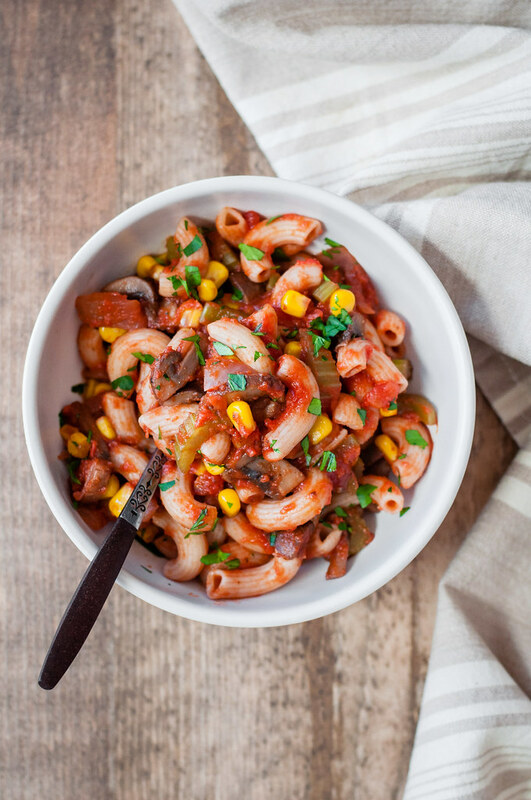 Without testing it, here’s what I would recommend: substitute a homemade, thinner tomato sauce for all three cups of the tomato products and add minced fresh garlic either to the tomato sauce or when sauteing the mushroom mixture. The wine is optional, so you can just leave it out. Would love to hear how it goes!